Just a quick note to say that the service manual is now available to buy and all pre-orders have gone out in today's post. It covers all the servicing work from BMW's Service Schedule, and extra things like stripping and cleaning the brake calipers. It includes removing and replacing all bodywork and the wheels. 156 pages, 132 B&W photos, A4 80gsm paper with wipe-clean clear acetate covers, spiral wire bound so it will lay flat when open. Thanks Mark. I received mine and it's everything that one would expect. Thank you sir and have a great Christmas. Thanks Mark, my copy arrived this morning. Just the job to make servicing nice and easy. Got my copy today. Thanks for putting this togeather. Every XR owner should have one. Thanks, ordered. 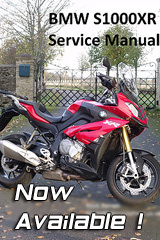 Is a PDF version available from BMW or the publisher? No, its only available on paper. Just to clarify, its not available from BMW. I write the books myself and publish them. Ordered mine a few days ago.....should be here soon. Thanks for producing the manual Mark. It will be used often..